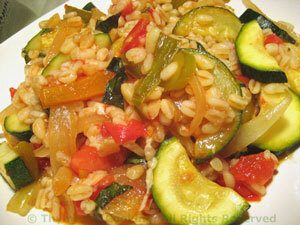 Barley with Zucchini (Courgette), Tomato, Thyme for Cooking summer side dish. Healthy barley combined with summer's bounty makes an easy, colorful side dish. Can be served hot or cold. Slice the pepper into strips. Cut the onion in half, then slice. Add oil, onion, pepper and sauté until starting to get tender, about 5 minutes. Add garlic, zucchini and sauté until zucchini starts to get limp, about 5 minutes. Add tomato, basil, cover and cook until tomato gets soft, 4 - 7 minutes longer. When zucchini is done add to barley and gently stir in vinegar and serve.